» Reviewed by William F. Deeck: ANNE NASH – Said with Flowers. Reviewed by William F. Deeck: ANNE NASH – Said with Flowers. ANNE NASH – Said with Flowers. Doubleday Crime Club, hardcover, 1943. Bart House #19, paperback, 1945. ’Twas the week before Christmas when the general factotum and chief roustabout of the flower shop owned and operated by Doris (Dodo) Trent and Nell Witter fell and broke his leg. Fortuitously, but perhaps not fortunately, a new young man in town visits the shop and appears qualified to fill in during the busiest time of the year. A day later a friend of Dodo’s and Nell’s is found stabbed to death, with one of the knives used for dethorning roses, outside the flower shop. On her body is the emblem of a fish, the trademark of Killer Karp — named thus, God help us, by the newspapers because of his habit of leaving the drawing of a fish with each murder victim — a serial murderer who had been working his way west from Boston and murdering lovely, young, and unmarried females in his travels. If the woman killed outside the flower shop is one of Karp’s victims, the serial killer had deviated almost totally from his previous pattern. If she had not been murdered by Karp, who in the small town of Pinecrest would murder a woman seemingly loved by all? Is the new flower shop assistant Killer Karp? Dodo and Nell join forces, when they can take the time from their hectic Christmas business, with detective Mark Tudor and his dog Svea to try to find the killer. There is excellent atmosphere, Dodo and Nell are real people, and the novel is well written if you don’t mind a colloquial style. The killer was evident fairly early on to this reader, but it didn’t spoil the enjoyment. Bibliographic Data: Anne Nash was the author of three detective novels starring Dodo and Nell between 1943 and 1945, then one stand-alone in 1946. 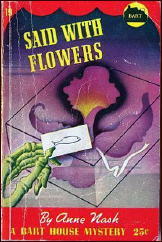 All four published were under Doubleday’s Crime Club imprint, with Said with Flowers being the first. Given Bill’s opening description of the two protagonists, I could have sworn that this was a book published this past week. Cozies today, the mass market paperback variety, are filled with small shop owners of all kinds, not to mention cookie and fudge makers, quilters and so on. I wonder if this was the first of this particular genre? As a final note, Bill’s final paragraph took me a bit by surprise. I wasn’t quite expecting him to have enjoyed it as much as he did. Maybe I ought to read my copy! I enjoyed “Said with Flowers” too. It is stronger as story telling, than as a mystery puzzle plot. This is the only one of Anne Nash’s books I’ve read – or even seen copies of. I have the same paperback you picture. Periodically I’ve made half-hearted attempts to track the others down – but they are not in Michigan libraries. Steve’s suggestion that this is the ancestor of today’s cozies is intriguing. The flower shop in this novel is less cutsie-pie than lots of the businesses in current cozies though. It is given a fairly realistic treatment. the new flower shops assistant, the Mysterious Young Man Stranger is named…Barney Miller. Thanks for the link, Mike. Your comments on the book are very interesting, indeed. I’ll really have to make an effort to find my copy. I’m not sure which series of contemporary “small shop owner” mysteries came along first. I’d have to do some investigation. One early one that I do remember is Susan Wittig Albert’s series of China Bayles cozies. She’s an herb shop owner, and the first book in the series was THYME OF DEATH, which came out in 1992. But in all likelihood there were others before that, with roots reaching (perhaps) all the way in the past to the Anne Nash books. Death on Demand (1987) by Carolyn Hart is a cozy (I think!) set in a small town mystery bookstore. Anthony Boucher gave a mixed review to “Said with Flowers”. He suggested the small town in the novel resembled Carmel, California. DEATH ON DEMAND fits the category perfectly, and it was immensely popular at the time. It had the plus of being a mystery taking place in a mystery bookshop, which helped provide all kinds of references to mystery authors and mystery fiction. I’m sure it made a lot of publishers and authors sit up and take notice.